Industry Canada to Foreign Affairs After CETA Leaks: Can We Get a Copy of the Text? As the Canada – EU Trade Agreement faces mounting opposition in Europe, it is worth looking back at the late stages of CETA negotiations that occurred after an October 2013 announcement that a deal had been reached. That announcement did not include a release of the text, which was still the subject of months of negotiations. In fact, long after the initial announcement, there were reports that European concerns with investor-state dispute settlement provisions were about to derail the entire agreement. 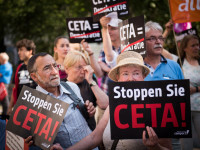 By July 2014, it was obvious that CETA was in jeopardy. In August 2014, there were more assurances from the Canadian government about an agreement, but still no text. That same month, the agreement finally did become public, but only after a German public television leaked it online.